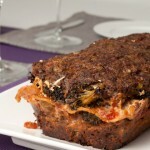 This gluten-free meatloaf has a hefty middle layer of lasagna, adding a bold flavor and beautiful presentation. Preheat oven to 375F and line a baking sheet with parchment or silicon mat. Place mushrooms, onion, pepper, broccoli, garlic, and zucchini on baking mat. Top with coconut oil, salt, pepper, basil and oregano. Roast in the oven for 40 minutes, flipping the veggies at the 20 minute mark. Once complete, reset oven to 350F and set aside. Meanwhile, sauté onion and celery in coconut oil on medium-low heat until translucent. Sprinkle with salt and pepper, and transfer to a large bowl. Add bison, eggs, tomato paste, broth, quinoa flakes, and flax in the large bowl. Wet hands and mix until fully incorporated. Transfer half of the bison mixture to well greased 8×4 loaf pan. 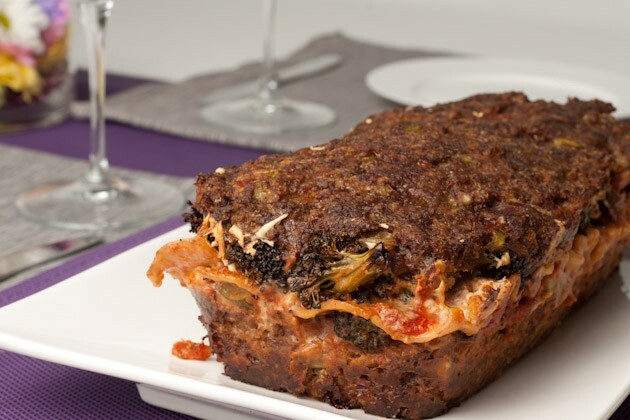 – I highly suggest you use a silicon loaf pan so that the loaf can be pulled out easily and placed on a plate to display layering. Top bison mixture with 1/4 cup marinara sauce, followed by half of the roasted vegetable mix, half of the daiya cheese, top with 2 lasagna noodles side by side and repeat one more time, ending with cheese. Top the lasagna layer with remaining bison mixture, make smooth with hands. Cook in the oven for 75-85 minutes, or until meat thermometer reads 160F. Once complete, allow to sit for 10 minutes before cutting.